A 63-year-old driver, whose name was not released, lost control of his big rig after a tire tread separation. His hydrogen peroxide load caught fire; the flames engulfed multiple vehicles. After the tire failure, the truck careened out of control on southbound Interstate 95 near mile marker 162, eventually smashing into the center guardrails. A passenger car was caught in the runaway truck’s path. Two of its occupants — 69-year-old Robert Racicot and 61-year-old Celina Ruel of Quebec — were rushed to a nearby hospital with serious injuries. The truck driver died at the scene. 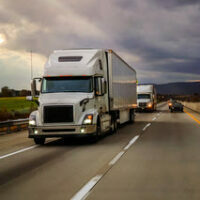 One of the first things to understand about this area of the law is that truck drivers and most other commercial operators are common carriers in Florida. Since they have a higher duty of care, it is easier to establish negligence in court. Duty is only one element of a negligence case. In order to obtain compensation for their injuries, the victims must also establish breach of duty. Breach is a fact question which the jury resolves, and it’s sometimes difficult to draw the line between a driving mistake that almost anyone could meet and a lack of care. Unsafe Driving: Since long-haul truck drivers routinely cross state lines, it is sometimes difficult to obtain accurate driving records. For example, if a truck driver gets a speeding ticket in Georgia, that infraction would probably not show up on the operator’s Florida driving record. The SMS captures data from different states and places it in a format that’s easy to follow. HOS Compliance: Hours of Service is a hot topic in the shipping industry. Federal regulators have stepped up their efforts to combat drowsy truck driving, and the trucking industry has fought these efforts tooth and nail. Two of the more important rules are the 70/80-7/8 rule, which limits drivers to 70 or 80 hours in seven or eight days, and the 34-hour restart rule that requires truckers to take at least 34 hours off before they start a new week. Vehicle Maintenance: This category is especially critical in accidents like the one described above. Sometimes equipment failure is the manufacturer’s fault, but more often, it’s the driver’s fault because of improper maintenance. Hazmat Issues: Drivers must meet special licensing requirements to haul hydrogen peroxide and other hazardous materials. Failure to maintain these high standards is clear evidence of negligence. The SMS also records information about alcohol or controlled substance use and the driver’s medical fitness to operate a large truck in Tampa. In addition to duty and breach, victim/plaintiffs in Florida must also establish causation, which includes both cause-in-fact and foreseeability, as well as the amount of damages. These claimants must establish negligence by a preponderance of the evidence, which means more likely than not. Was acting in the course and scope of employment. All truck drivers are usually “employees” in negligence cases, even if they were technically owner-operators or temporary agency workers. Furthermore, any act that benefited the employer in any way falls within the course and scope of employment. Large truck crashes often involve complicated legal issues. For a free consultation with an experienced personal injury attorney in Tampa, contact The Matassini Law Firm, P.A. An attorney can connect victims with doctors, even if they have no money or insurance.